REVERENCE AND THE EMBRACE OF GOD’S FIERY LOVE! We are brought into the world by God’s loving act that we call Creation. Indeed, all of the beauty of creation manifests God’s all-abiding love for us and His Divine Providence—that He cares for us with the love of the best of all Fathers. By contemplating the beauty of creation, our minds, hearts, and souls are elevated to the Creator Himself who is the origin and author of all true beauty! OUR PURPOSE ON EARTH. God has not created you at random, without meaning and purpose. Quite the contrary, you were created to Praise God with every fiber of your being, but still more, you were also created to Reverence your loving and providential Creator and Father. READ EXODUS CHAPTER 3: THE VOCATION OF MOSES AND THE BURNING BUSH. Now let us gather from the abundant harvest of the Word of God, from Exodus in the person of Moses, the countless graces that God has in store for you. How great, generous, and loving is God our Father! 1. MOSES IS A SHEPHERD… God is your Shepherd. The most famous Psalm in all of humanity is the Psalm of the Good Shepherd (Psalm 23). “The Lord is my Shepherd, there is nothing I shall lack…” Talk to the Lord as your Shepherd. Let Him lead you and guide you to fertile and fresh grazing grounds. 2. NOW CONTEMPLATE WITH MOSES THE BURNING BUSH. Something extraordinary is happening: a bush is burning, it is really on fire, but it is not being consumed! Draw close to the bush, contemplate it. Try to plumb the depths of the inner meaning of a bush that is on fire but not consumed! 3. TAKE YOUR SANDALS OFF: THIS IS HOLY GROUND!!! All of a sudden a clear and unmistakable voice can be heard, indeed the voice of God: “Take off your sandals, for the place where you are standing is holy ground.” In other words, this is not some common or ordinary ground but truly sacred ground. You must remove your sandals. 4. EXAMINATION? What are you carrying, without or within your person, that God is challenging you to leave, to discard, to reject, something you are clinging to that is not worthy of an all-consuming, loving, but also demanding God? 5. OUR GOD IS A BURNING FIRE! The Book of Hebrews describes God as a burning fire! What is present in your heart, mind, and soul that needs to be burned at this time and consumed by the loving flame of God’s love? 6. CALLED BY NAME. God calls Moses by name. God calls you by name. Before the burning bush, with sandals now removed, it is no longer Moses who is being called by name, rather it is you, yes, you whom God is calling by name. Listen attentively as God calls you; He’s calling your name!!! 7. YOUR IMPORTANCE! Perhaps up to now in your life, you have had a somewhat distant relationship with God. However, in this meditation/contemplation something has clicked that never did before. As you hear your own name called by your loving Father, you come to a keen and penetrating awareness that God is your Father, that this Father truly loves you with an everlasting love. This love that your Father God has for you is eternal, immutable (meaning unchanging), strong, and at the same time very tender. 8. THE FIRE OF THE HEART OF JESUS AND YOU. Jesus said, “Believe me when I say that I am in the Father and the Father is in me.” (Jn 14:11) Now your meditation/contemplation takes on a new dimension! As you draw closer to this fantastic reality of the burning bush there is a mystical transformation: the bush is no longer a burning bush. Rather the bush is the Person of Our Lord and Savior Jesus Christ! The fire is emanating from His Most Sacred Heart burning with love for you! Contemplate this Mystical reality. 10. RESTING ON THE SACRED HEART OF JESUS. As you draw close to the Sacred Heart of Jesus burning with love for you, He invites you to come closer and actually rest your head on His Sacred Heart, as Saint John the Evangelist did at the Last Supper during the Institution of the most Holy Eucharist. 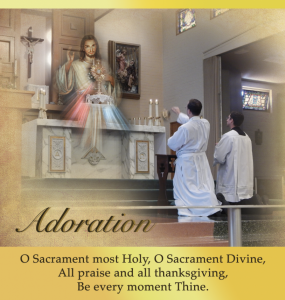 As you rest on His Sacred Heart, listen attentively to His heartbeat. What do you hear as you rest on the most Sacred Heart of Jesus? Listen attentively in calm, peace, and patience. Then talk to the loving and Sacred Heart of Jesus from the very depths of your heart. The art of prayer: rest on the Lord’s Sacred Heart, listen with calmness and great peace, then open your own heart in loving dialogue with the Lord Jesus, who is truly your Good Shepherd, your Best of Friends, your Savior, the burning Fire of Charity in your life! What reverence you should have for Our Lord and God! But also this reverence before the sacred, this reverence before God Himself, should draw you gently but securely into the loving embrace of God, His holy will, and all that pertains to God in your life! Let this encounter with Moses and the burning bush, that is truly the Sacred Heart of Jesus burning with love for you, change your life!